Delphine Leymarie sculptural necklace is an atypical homage to the bonds of love. Evoking the heart-pounding excitement of the moment you and your love first met, Delphine Leymarie's sculptural necklace is an atypical homage to the person in your life who makes your heart skip a beat. Using the ancient lost wax technique, she sculpts a strand of sterling silver into an energetic line that represents the rhythmic pulse of your heart. 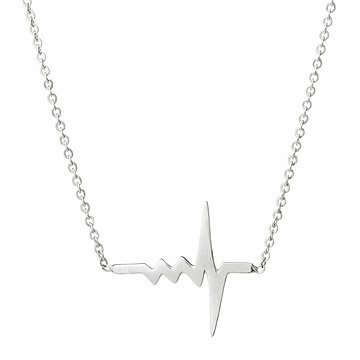 An eye-catching accessory for the romantic who'd like a sleek and contemporary alternative to the traditional heart-shaped charms, this poetic necklace is sure to resonate with those looking for an offbeat way to express how much they care. Handmade in New York City. Bold simplicity. That’s Delphine Leymarie’s goal in every piece she creates. Many of her designs employ an ancient lost wax technique, which, when combined with sleek lines and glimmering metals, creates a delicate yet substantive effect. This seamless blend of femininity and masculinity, as well as ancient meets modern, allows the wearer to take Delphine’s pieces from casual to dressy without a second thought. Her hope is that each piece becomes a part of the wearer’s life story. She lives and creates in New York City.